Have a Former New York City Prosecutor Fight Your Ticket! Call us at 800-893-9645. About Our Firm: At Villanueva & Sanchala, PLLC we excel at getting tickets dismissed or reduced. Our team of traffic and criminal defense lawyers have over 25 years of legal experience. They are lead by former prosecutor Joseph P. Villanueva. As a former prosecutor, Mr. Villanueva prosecuted major felonies and misdemeanors. He has the experience and acumen to analyze your case and give you the best defense possible. 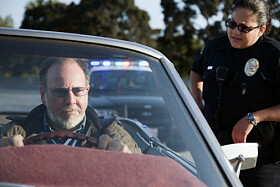 His experience may make the difference having your license suspended or revoked. Call us now at 800-893-9645. Q. I received a speeding ticket on the NYS Thruway for going 85 in a 55 mph zone. How many points would that ticket be? A. That is a 6 point ticket, since anything from 21 to 30 mph over the speed limit is a six point violation. If you are found guilty of the charge, you will be fined an additional $300.00 by New York State. This is called a driver’s assessment. Q. I have a ticket in NYC TVB. Can I get a plea bargain deal? A. No. There are several TVB in the State. Their rules do not allow plea bargaining. Every case must go to trial. Q. I live in Haverstraw and got a speeding ticket in Massachusetts. Will the points transfer back to NY? A. No. But, the conviction will be reported to NY and this can affect your insurance rates. Q. I was issued a speeding summons by the Rockland County Police. Is there a difference between a ticket and a summons? A. They are the same thing. Q. A New York State Trooper wrote me ticket for unsafe lane change and driving without insurance in Ramapo Court with the wrong date to come to court. Specifically, the ticket gives me a Sunday court date. Can I get this case dismissed? A. Your case will not be dismissed on those grounds. This is not defective in the eyes of the law. Q. I was issued a ticket in Greenburgh seven years ago. I just got notice that I must appear in court. Is there a statute of limitations? A. While there are legal arguments to get your ticket dismissed, the statue of limitations will not succeed. Our firm can be frequently found representing clients throughout New York State. Some courts that we often represent clients include Yonkers City Court, Tuckahoe Village Court, Pound Ridge Justice Court, Mount Kisco Justice Court, Somers Justice Court and Eastchester Justice Court.